Here I've made a video of our visit to the area. 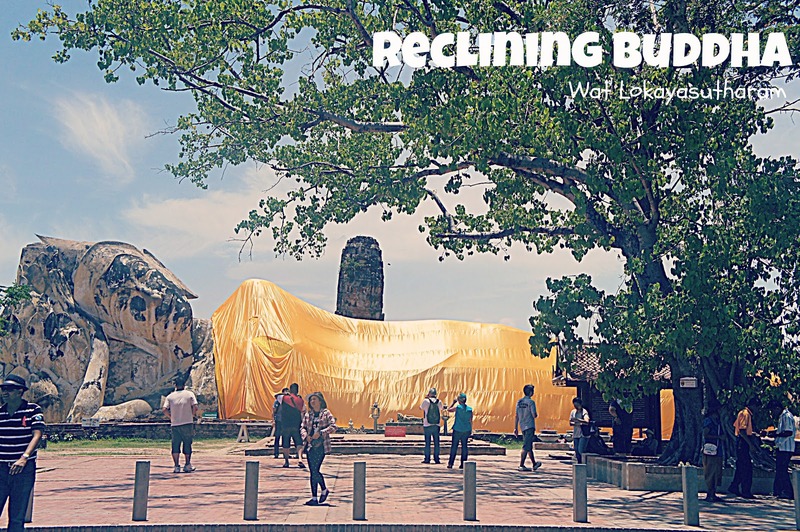 In the beginning of the video you will notice the ruins of an ancient temple before we reached the Reclining Buddha. We we're given 10 minutes to scour the area and take pictures. We only took few photos here because I was busy looking at the souvenir stalls in front of this statue. And my husband made sure to grab a fresh and cold coconut drink. If serve inside a bottle it costs 45 THB, if serve with the coconut meat it costs 50 THB. The lady serving is in full makeup complete with lovely curls. I just love the Thai's dedication to look good no matter where and what. Prepare 5 THB if you're going to take a visit to the toilet. Other than the reclining buddha there's nothing much to see or do in the area so we didn't really take that much time here. Here's a whole body photo of the reclining buddha. He's huge. FYI : The reclining position of buddha represents buddha at the moment of death. And now we are all very hungry! We can't wait to cruise back to Bangkok and have a feast at the River Sun Cruise boat.